BMW has taken the wraps off its new flagship SUV, the X7. This comes four years after the SUV was first announced back in 2014 and here’s all you need to know about the first-ever X7. At 5150mm x 2000mm x 1805mm, the BMW X7 is 158mm longer and 60mm taller than the fourth-gen X5 (yet-to-be-launched). It has a wheelbase of 3100mm, which is 125mm more than the X5’s. However, the X5 is wider than the X7, albeit marginally by 4mm. If we compare the X7 to its arch-rival the GLS, the BMW is 20mm longer, 150mm wider and has a 25mm longer wheelbase. Thanks to leaked patent images, we had a fair idea of what the new X7 would look like. Its front fascia features the largest iteration of BMW’s new single-piece kidney grill, which is flanked by sleek LED headlamps. The headlamps look inspired by those on the BMW 8 Series. However, they are more horizontally aligned in the SUV. The X7 also gets a huge front bumper which adds to the butch styling of the flagship BMW SUV. At the rear, the X7 reminds one of the 7 Series sedan with its golf club-like LED tail lamps that are connected by a chrome applique. Other notable elements in the rear profile include a split tailgate like the X5, a large and upright rear windshield and a large bumper that houses a skid plate and exhaust tips on either side. The side profile of the GLS rival looks clean and gets large windows for the first and second-row seats and a big quarter glass for the third row. It also features an ice hockey stick-like chrome element running across the lower half, much like the flagship 7 Series sedan. The X7 is offered with 20-,21- or 22-inch alloy wheels, depending on the variant. Step inside the cabin and everything seems very familiar just like any other modern BMW, including the 8 Series, fourth-gen X5, the Z4 and the recently unveiled 3 Series. It gets a host of features, including two 12.3-inch displays for the instrument cluster and infotainment, four-zone climate control with the option of a five-zone climate control, six-colour ambient lighting, ambient air package with six fragrances (optional) and 1500W 20 speaker Bowers & Wilkins 3D sound system (optional). Other features on offer include auto parking, air suspensions at both axles and a three-section panoramic sunroof which, with the help of embedded LEDs, can illuminate more than 15,000 graphic patterns and generate a display reminiscent of a starlit sky. As expected, the X7 is also equipped with a host of driver assistance systems like active cruise control with stop & go function, steering and lane control assistant, lane change and lane departure warning, lane keeping assistant and side collision protection, evasion aid, crossing traffic warning, wrong-way warning and the latest generation of the BMW Head-Up Display. The X7 is offered in four different trims: xDrive40i, xDrive50i, xDrive30d and the M50d. Since the X7 is an SUV, it comes with BMW’s xDrive intelligent all-wheel-drive system. This AWD system can send 100 per cent of the power to the rear wheels when required. The X7 is also available with an optional ‘Off-Road’ package. Available for all model variants apart from the BMW X7 M50d, the Off-Road package allows the car’s set-up to be adjusted in a variety of ways with the help of the standard two-axle air suspension. The driver can choose from four driving modes: xSnow, xSand, xGravel and xRocks. 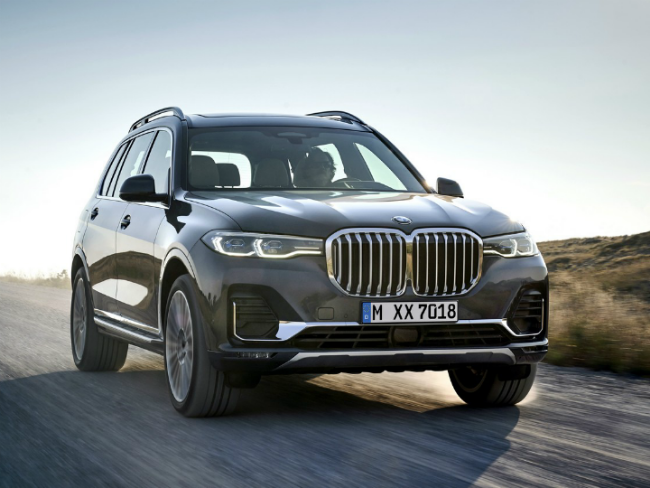 The BMW X7 will go on sale in various international markets by March 2019. Expect the SUV to land here by the end of the 2019 or early 2020. When launched, it will take on the likes of the Mercedes-Benz GLS and the Land Rover Discovery.